Apollo 11: Where were you? 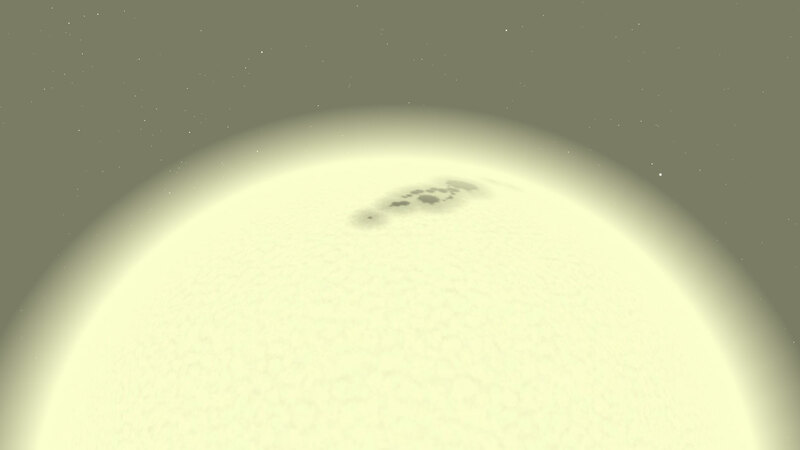 Pro 7 includes known exoplanets in 3D, with proper size, orbit and planetary textures! You can visit and land of the surface of every single one. See an extra-solar sunset from the surface of Kepler-62e! Pro 7 offers a user-optimized interface - simple, fast, dynamic! 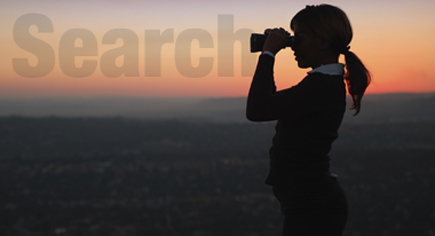 And, with "Universal Search" resulting matches reference all features, databases, SkyGuide references, events, and favourite files. Using state of the art OpenGL high performance graphics, all stars in Pro 7 are now accurately rendered as 3D bodies complete with classification-appropriate color, surface texture and relative radii. Starry Night Pro 7 makes it easier than ever to access professional grade features and databases, and control your telescope. Engineered for precision, designed for research, and continually evolving for the astronomer who expects the very best in-class planetarium experience. Link Take a cinematic High Definition journey through the solar system. Starry Night Cosmic Cinema showcases the incredibly rich and detailed OpenGL high-performance graphics rendering machine that has set the industry standard for excellence in astronomy software. Exoplanets modelled as 3D bodies with proper location, size, orbit and planetary textures. New simple, fast & streamlined user-optimized interface, including a new "Universal Search" for objects, Starry Night files, SkyGuide references, options, events, and more. Every star now accurately rendered as a 3D body with classification-appropriate color, texture and relative radii. Accurate outlines and positional data for 1400 dark, emission, planetary and reflection nebulae. 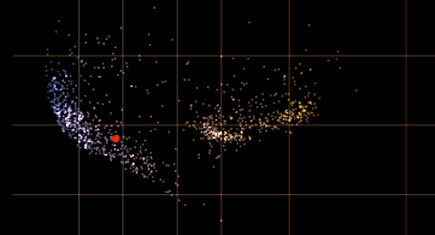 Hertzsprung-Russell diagram tells us about a star’s age and its mass. 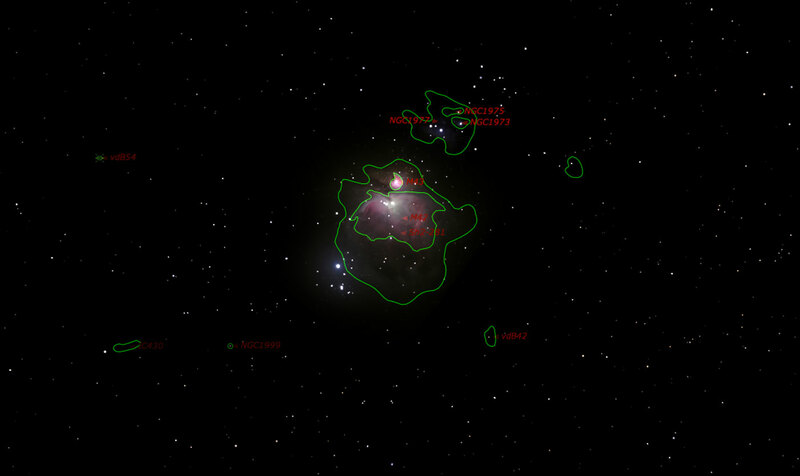 Easily identify stellar oddballs, such as white dwarfs, supergiants, and extremely massive main sequence stars. 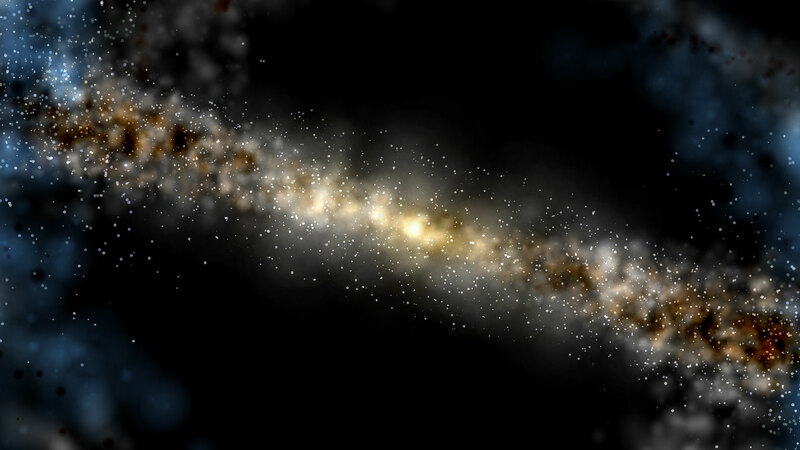 Exclusive Extragalactic 3D Database - 100,000 galaxies - over 1 billion lights years of space. Updated Surface Maps of Planets and Moons. 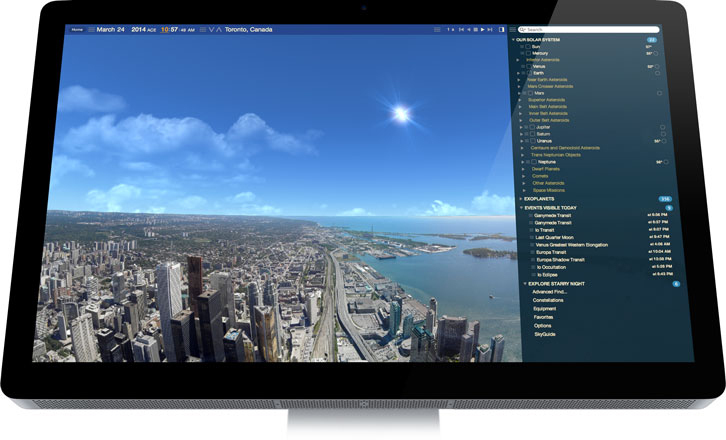 Restyled SkyGuide with updated tours and interactive multimedia. 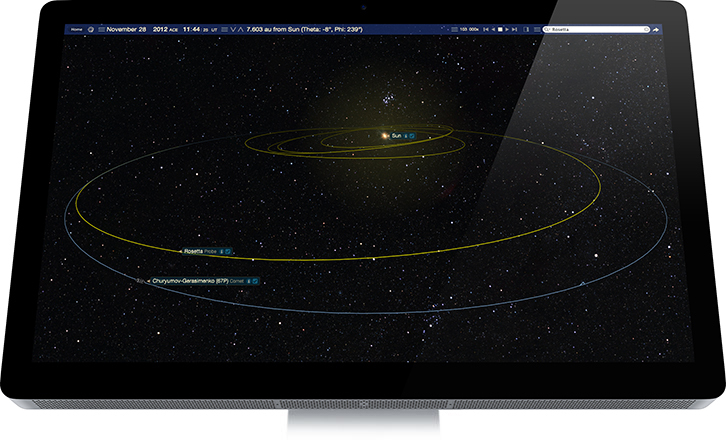 New and updating space missions with 30 new detailed and accurate 3D models of spacecraft and their trajectories. Updated Messier catalog with new high resolution images for star clusters, nebulae, and galaxies. + Apollo Space Missions: Celebrating 45 years since the Apollo 11 Moon landing, July 20th, 1969! 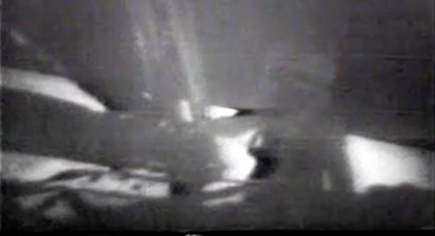 The first attempt at a manned lunar landing took place in July 1969. Astronauts Neil Armstrong, Edwin "Buzz" Aldrin, and Michael Collins would repeat the Apollo 10 mission. 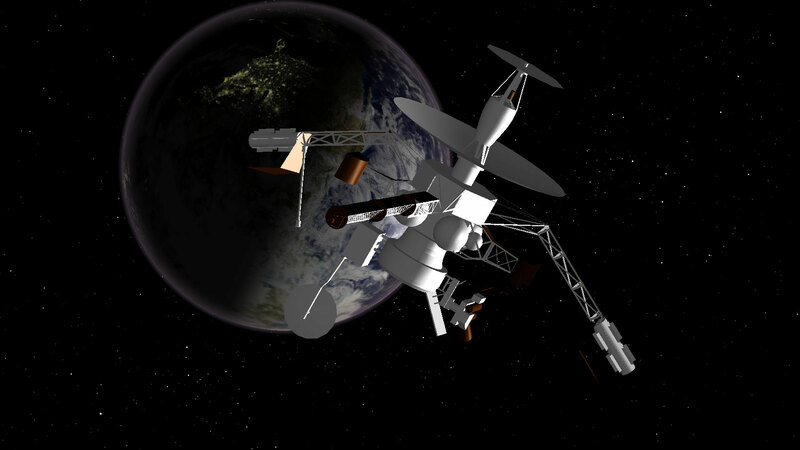 But when the Lunar Module reached the point 50,000 feet above the lunar surface, the descent engine would be fired for twelve minutes and the crew would attempt to land on the moon. The Apollo 11 lunar landing mission crew. 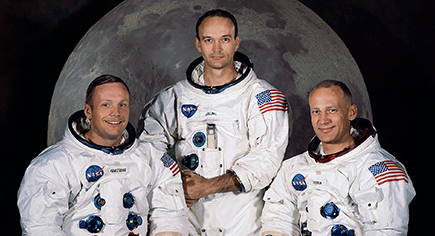 From left to right: Commander Neil A. Armstrong, Command Module Pilot Michael Collins, Lunar Module Pilot Edwin "Buzz" E. Aldrin Jr.
Click image to play the video! 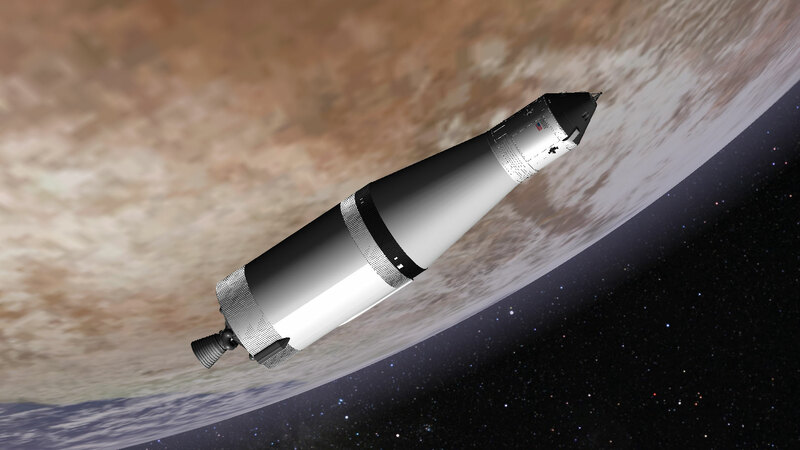 VIDEO: Apollo space missions in Starry Night Software. Armstrong and Aldrin spent 2.5 hours outside the Lunar Module, collecting 21.5 kg (47.5 lbs) of lunar samples. They erected an American flag, received a call of congratulations from President Nixon, and inspected their Lunar Module, Eagle. Link Celebrating 45 years since the first landing on the Moon on July 20th, 1969! 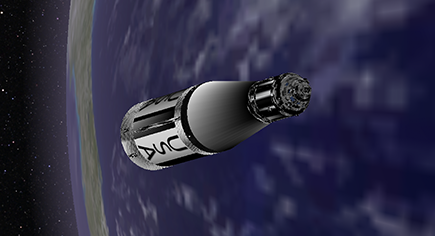 Starry Night Pro 7 accurately simulates the trajectory of nine Apollo missions, including Apollo 11 landing on the moon, July 20th, 1969! The lunar trajectories of the nine Apollo missions, which flew to the Moon and back during the 1960's and 1970's, were calculated by analyzing official archived NASA data. 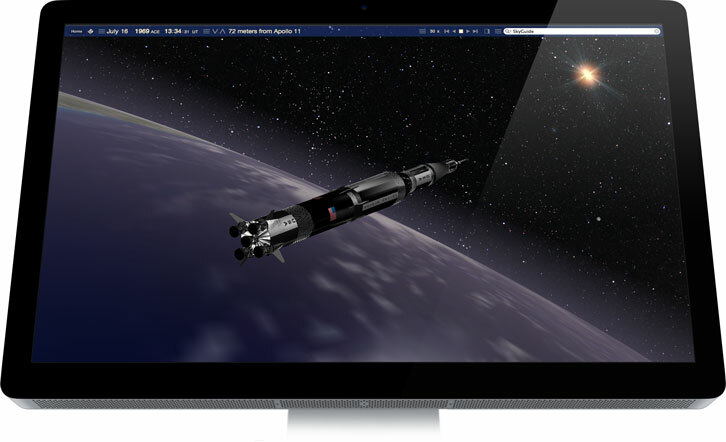 By leveraging the sophisticated technology that powers all Starry Night software, Starry Night Apollo allows space enthusiasts to view the moon and celestial objects just as they appeared decades ago - emulating the Apollo crew's actual space travel experience. "The historic Apollo missions are an indelible part of the American experience and psyche," said Seth Meyers, COO of Simulation Curriculum Corp. "Generations remember Neil Armstrong's 'one small step for man,' and with Starry Night Apollo, millions of space enthusiasts are able to vicariously experience these important space missions with precise, true-to-life simulations." Link Known exoplanets modelled as 3D bodies with proper location, size, orbit and planetary texture. Until recently, our solar system was the only planetary system humans knew. It was even thought by some that our solar system was unique in the universe. This changed in the early 1990s, when astronomers began to discover the first extrasolar planets, worlds orbiting other stars. Since the first discovery, astronomers have found approximately 1800 extrasolar planets. Astronomers now believe that planetary systems are plentiful throughout the universe. 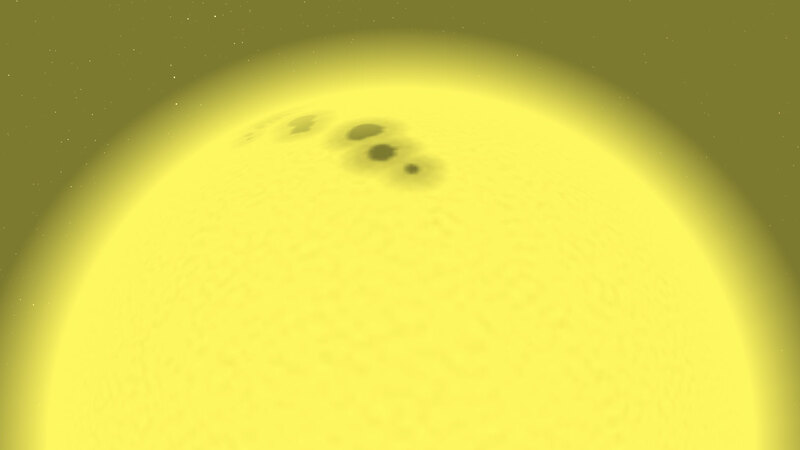 Version 7 includes known exoplanets as 3D bodies with proper location, size, orbit and planetary texture. You can visit and land of the surface of every single one. 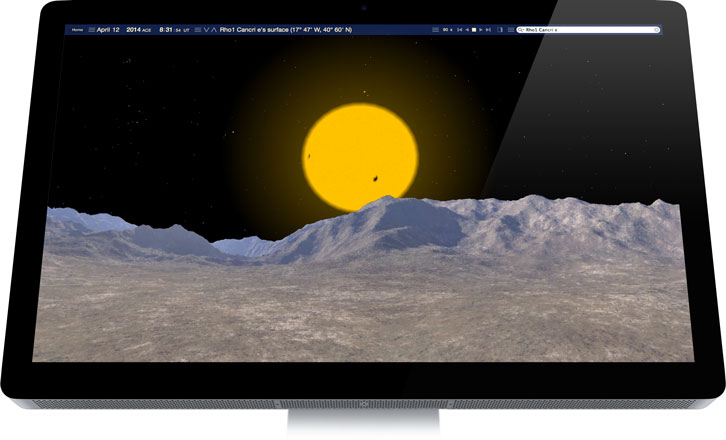 See an extra-solar sunset from the surface of Kepler-62e! Link New user interface with Universal Search for objects, Starry Night files, SkyGuide references, options, events, and more. Starry Night makes it easy to locate the position of the Sun, and over 5 million other space objects—including all the planets and their moons, comets, asteroids, satellites, Messier objects, the complete NGC-IC catalog, and more. If you are interested in a specific target such as a planet, a constellation, or a bright new comet, all you have to do is type its name into the Universal Search field.. Moreover, you can also use Universal Search to find different program features & options, Starry Night files, SkyGuide references, special celestial events, and much more. The all new Pro 7 user interface has been carefully re-designed to optimize your software experience. 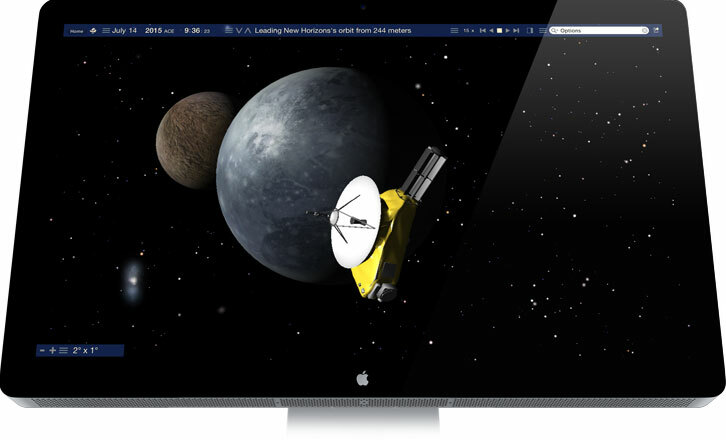 The dynamic UI allows faster access to all your files, features & databases, while also providing the ability to easily hide-away the menu system for a deeply rich, and transparent, planetarium experience. Link Every star now accurately rendered as a 3D body with classification-appropriate color, texture and relative radii. Most stars appear white, but look closely and you'll notice that some do have a color, often a slight blue or orange hue. Star colors are not very saturated, and since the human eye is not particularly sensitive to colors in low-light conditions, the colors are subtle. A reflecting telescope can enhance the colors, but we wary of inexpensive models that can refract light in such a way that the stars exhibit false colors. 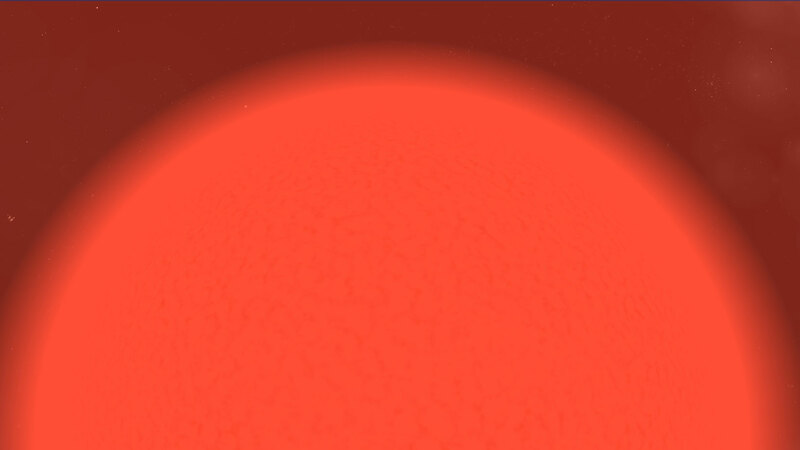 Red stars—like Antares, Aldebaran, and Betelgeuse—are cool. Blue stars—like Deneb, Rigel, and Spica—are hot. Bright red stars (which actually look orange or even yellow) are red giants or supergiants—hugely swollen stars with bloated atmospheres. 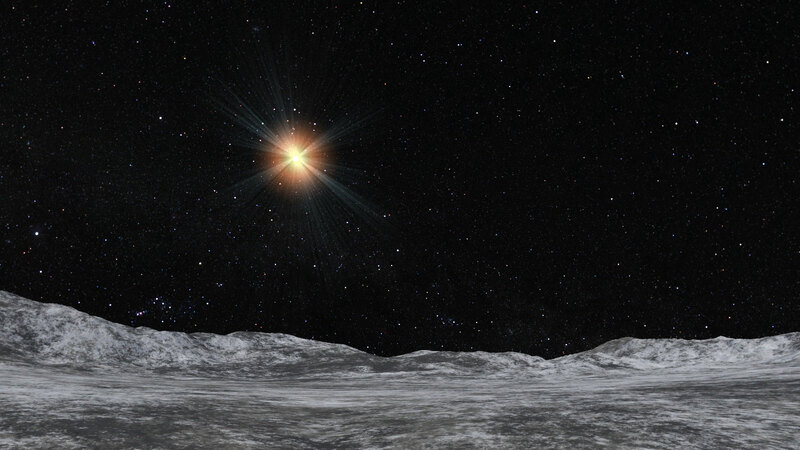 They can be so large that, were one placed at the center of our solar system, Mars would orbit beneath its surface! In Pro 7, every star is now accurately rendered as a 3D body with classification-appropriate color, texture and relative radii. 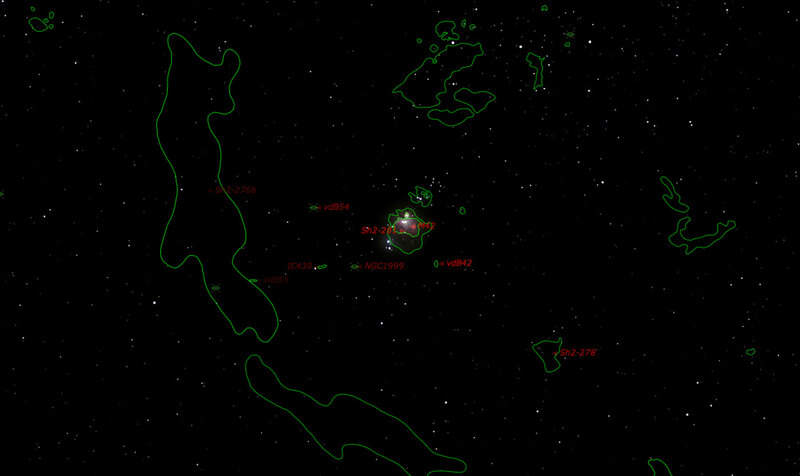 Link Accurate outlines and positional data for 1400 dark, emission, planetary and reflection nebulae. Space isn't as empty as you might think. In fact, the area between the stars is laced with gas and small dust particles. In places, this stuff collects into clouds, called nebulae. 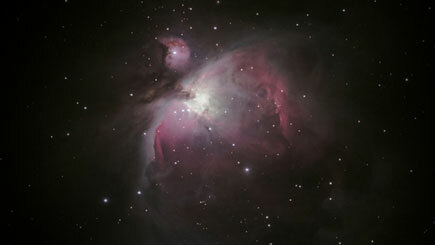 A typical nebula contains about 74% hydrogen, 25% percent helium, and 1% heavier elements. Nebulae are where new stars form, but not all nebulae are destined to become a new stellar nursery . It all depends on the temperature and the density of the cloud. Gravity works to pull the gas and dust together, but the material itself exerts an outward pressure. The warmer the material, the more active it is, and the harder it pushes. 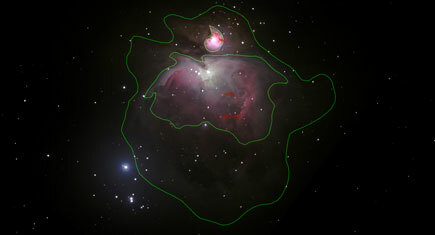 Starry Night Pro 7 includes accurate outlines and positional data for 1400 dark, emission, planetary and reflection nebulae. 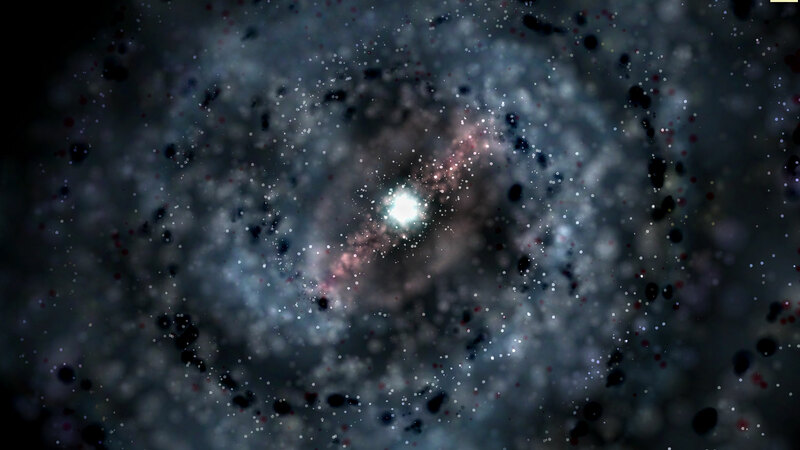 Link The exclusive Starry Night Extragalactic 3D Database now includes over 200,000 galaxies encompassing over 1 billion lights years of space. The exclusive Starry Night Extragalactic 3D Database will include over 200,000 galaxies encompassing over 1 billion lights years of space. Most of the universe lies beyond the edge of our galaxy. 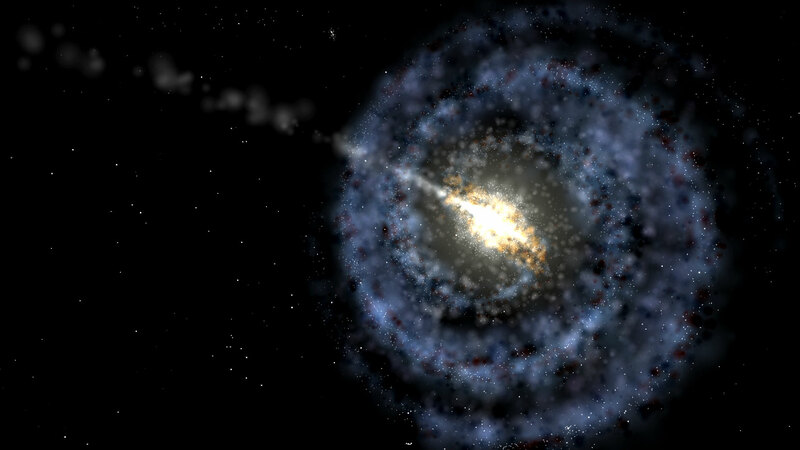 The Milky Way, after all, is but one among billions of other galaxies. And just as stars form into clusters within our galaxy, so too do the galaxies form their own groupings. 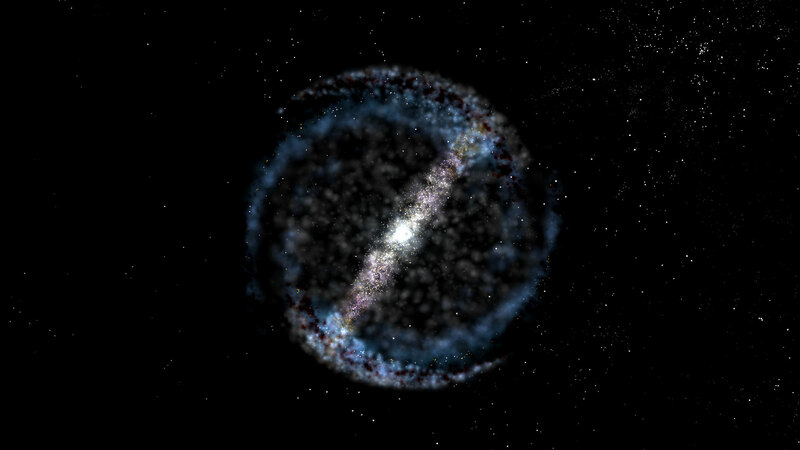 In Pro 7 you can simulate our known Universe! 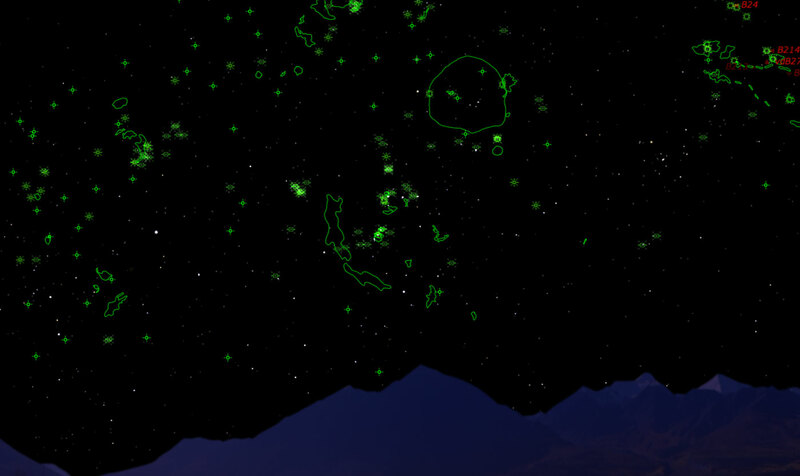 And all the galaxies in Starry Night are rendered with an advanced 3D particle graphics engine. Its easy to see how the universe is organized - with long filaments of clustered galaxies set against immensely dark stretches of absolute emptiness. 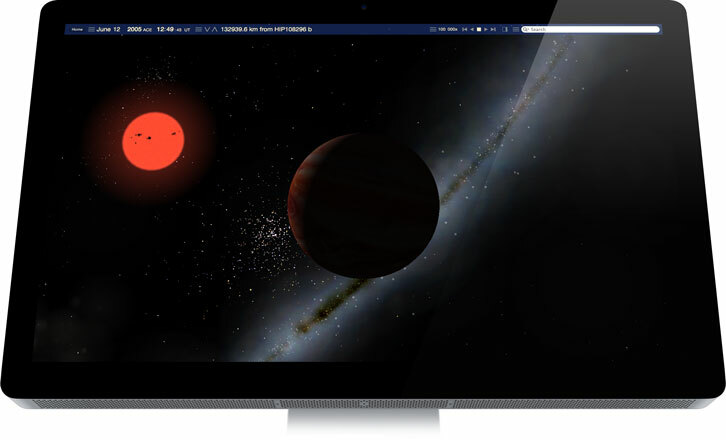 Link The SkyGuide pane is a link to dozens of interactive multimedia tours that explore the fascinating science and history of the solar system, the stars, the galaxies, the beginning of time, and the fate of the universe. 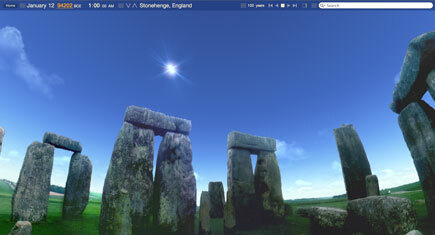 SkyGuide works just like a web browser; click on the links to take a tour. Over one hundred interactive multimedia tours await you in the SkyGuide pane. These in-depth experiences reveal the fascinating science and history of the solar system, the stars, the galaxies, the beginning of time, and the fate of the universe. As you and SkyGuide explore together, you will learn tips for navigating the sky, fun facts of the solar system, seasonal tours of the sky, and much, much more. Throughout this multimedia matrix you’ll discover images and movies to enhance the experience. Our solar system • The Zodiacal Light • The Sun • The sunspot cycle • Solar eclipses • Auroras and solar storms • Mysteries of the Sun • The Earth • Artificial satellites • Space Missions • Meteor showers • The Moon • The phases of the Moon • Lunar eclipses • Full Moon names • Top ten Moon facts • The day the Moon was made • The Apollo Missions • The Planets • Planetary motions • The moons of planets • The Asteroids • The comets • The stars • Planets around other stars • Shape-shifting constellations • Our Galaxy • Nebulae • Novas and supernovas • Neutron stars and black holes • Other galaxies • Giant Leaps • and more. 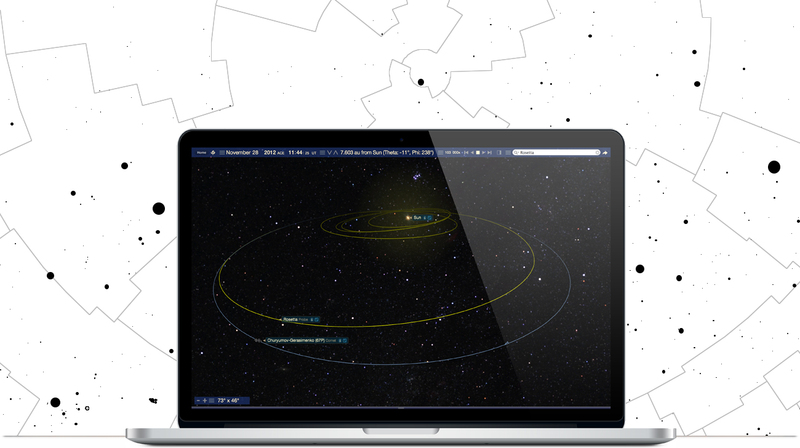 Link New and updating space missions with 30 new detailed and accurate 3D models of spacecraft and their trajectories. 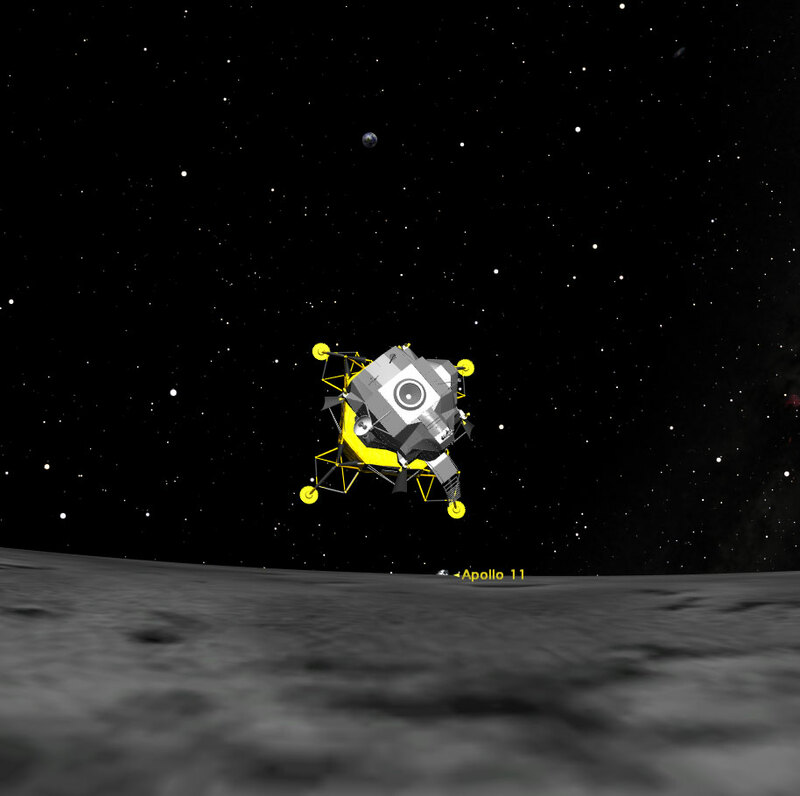 Pro 7 lets you join in with both manned and unmanned space missions. 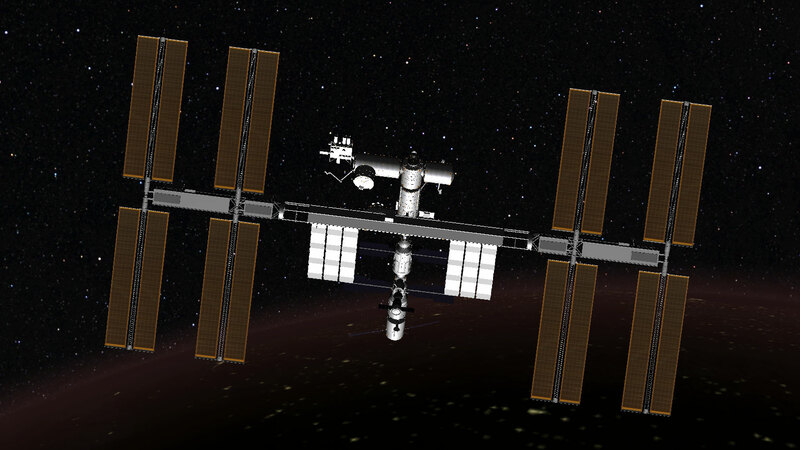 Hover above Earth in the International Space Station. Launch the two Voyager spacecraft missions to explore and photograph the gas giants: Jupiter, Saturn, Uranus, and Neptune. 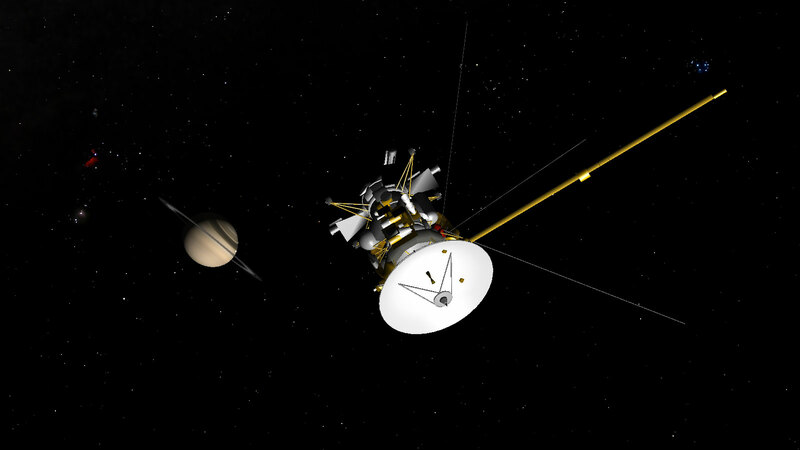 Hitch a ride with the Cassini and Huygens project to study Saturn and land on its moon, Titan! 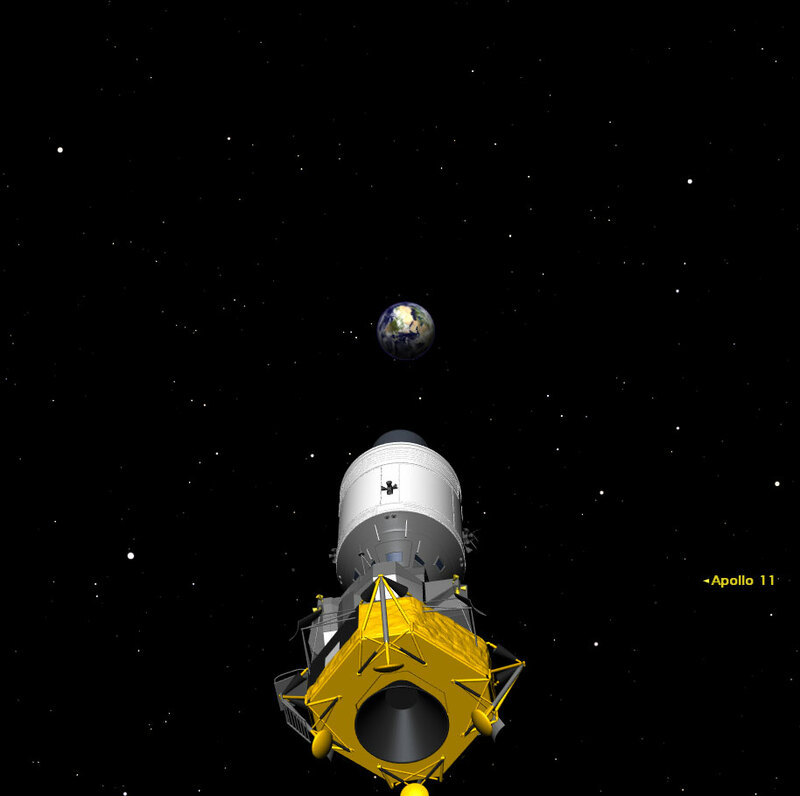 Join the Galileo spacecraft as it the observes a comet colliding with Jupiter. 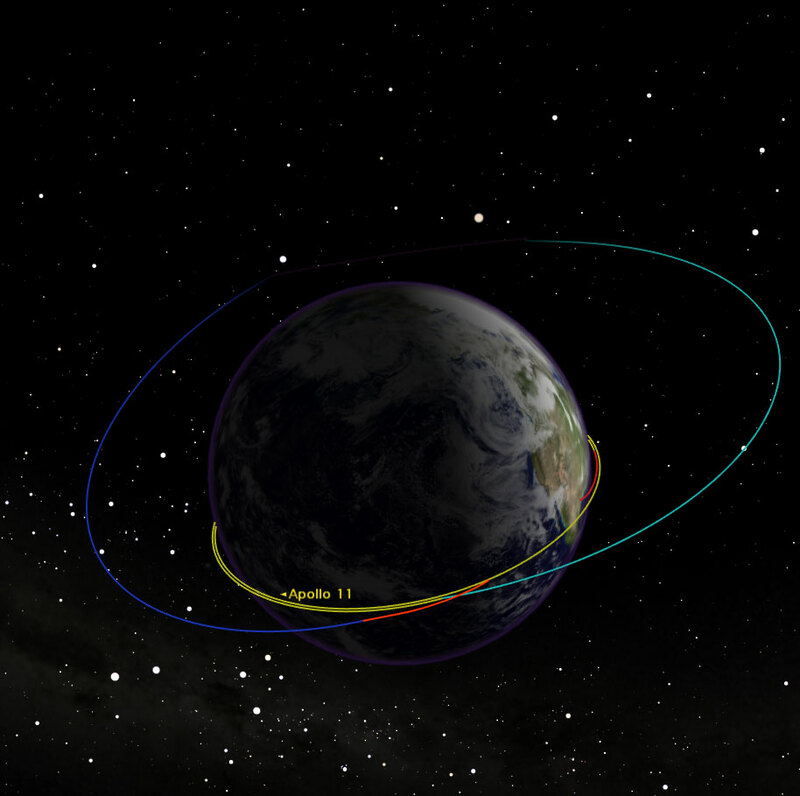 Pro 7 includes new and updating space missions, with 30 new detailed and accurate 3D models of spacecraft and their trajectories. Watch a cinematic journey through the cosmos in High Definition, showcasing the incredibly rich and detailed Starry Night software OpenGL graphics that have set the industry standard for excellence in astronomy software. 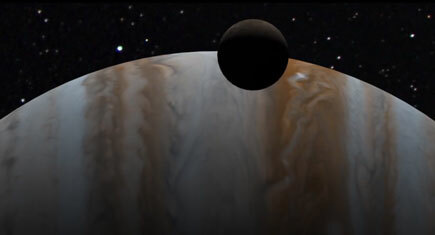 Enjoy epic flybys of Mars, the Moon, the asteroid belt, Neptune, Jupiter, and more. All scenes created with Starry Night Pro and featuring the soulful dubstep soundtrack "Sunday Morning" (original mix) by Eye Depth. If you enjoy the video please share it with others! Link Take a trip, faster than the speed of light, from the farthest frontiers on the known Universe, flying through thousands of galaxies, across the MilkyWay, into our solar system, and finally, at home, on planet Earth. Starry Night can show you the sky from your own backyard or from any other location on Earth. But that’s only the beginning. You can lift off and travel to many thousands of places within our galaxy, or instantly jump to any one of them. Visit hard-to-reach spots like the North Pole. 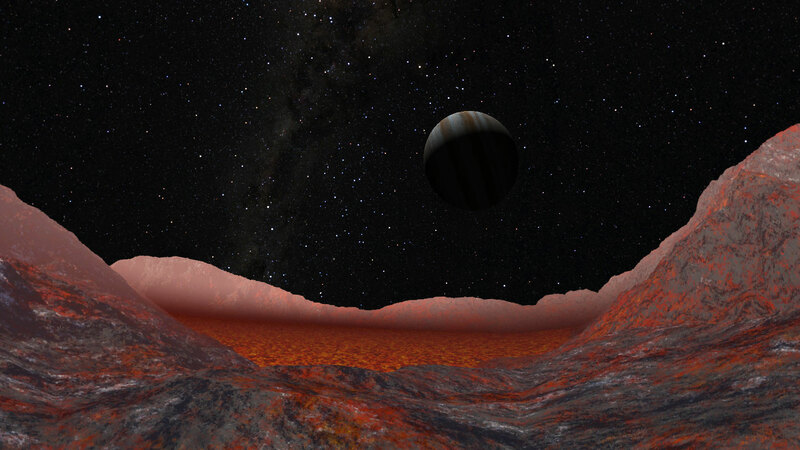 Or cruise the solar system on the lookout for fascinating vantage points. It’s easy to change your location. 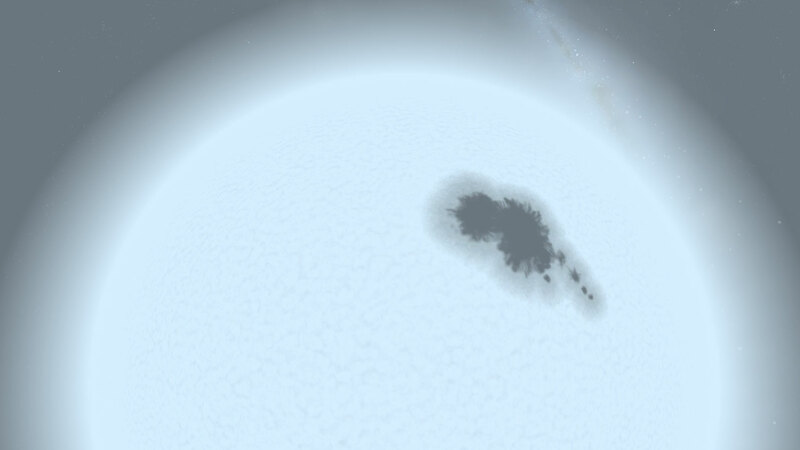 Start by selecting from a list of over 8000 real places in the universe. If your chosen spot is not on the list, you can always add a new one. And, just as you changed your viewing location on Earth, you can also view the cosmos from anywhere in space! 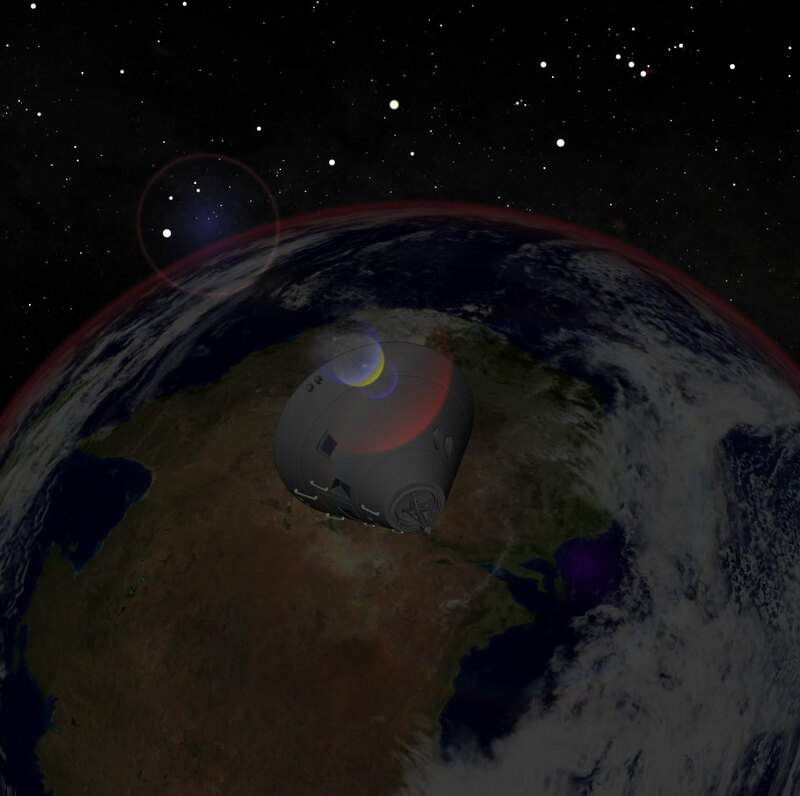 Go to the Moon and witness a total eclipse from one of the Apollo landing sites. 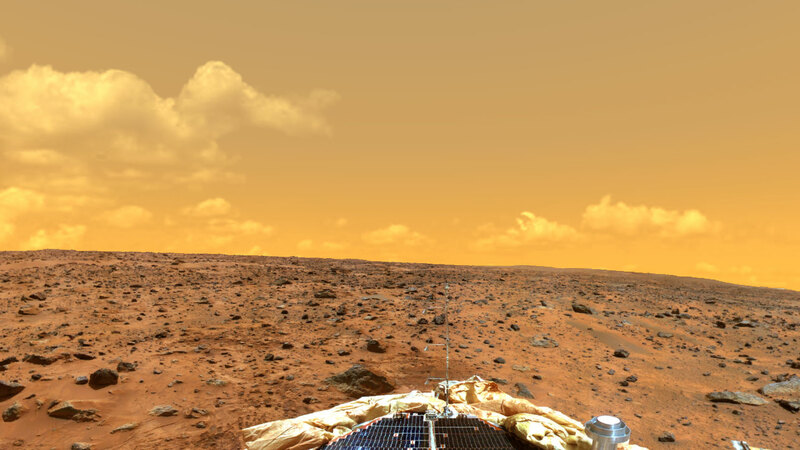 Watch the sunset from the surface of Mars or one of the newly discovered exoplanets. Or even ride a comet as it makes its long trek around the Sun. You are limited only by your curiosity! Link An H-R diagram tells you about a star’s age and its mass. Each dot on the diagram represents a star. 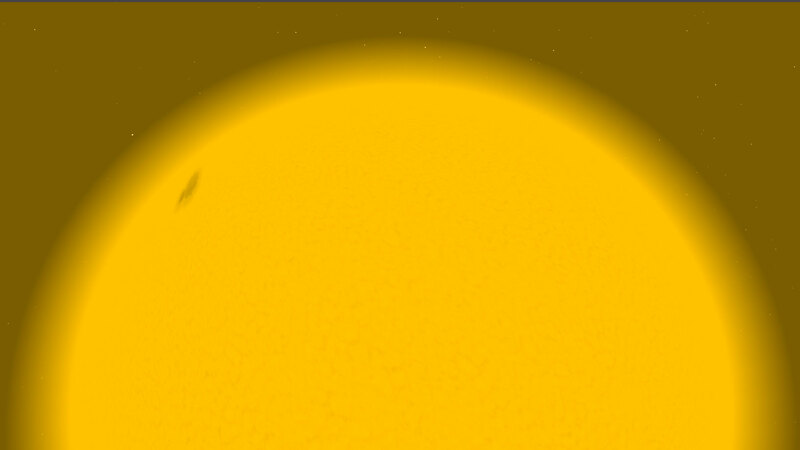 An H-R diagram tells you about a star’s age and its mass. Each dot on the diagram represents a star. The diagram plots star luminosity (the amount of light and energy emitted by the star) on the vertical axis against star temperature on the horizontal axis. The stars plotted in the H-R diagram are the same stars currently onscreen. You can click on any star in the H-R diagram, and Starry Night will identify this star on the screen. This makes it easy to identify stellar oddballs, such as white dwarfs, supergiants, and extremely massive main-sequence stars. Conversely, you can point the cursor at any star in the main window, and Starry Night will highlight the star’s position with a red dot on the H-R diagram. The H-R diagram is fully dynamic. If you scroll around the screen or change your field of view, the stars shown onscreen will change, and the H-R diagram will update to plot these new stars. The Graph offers a way of examining changes in an object’s qualities over time. The horizontal axis of the Graph always plots time, while the vertical axis can plot one of several different qualities (magnitude, altitude in sky, distance, etc.). It is possible to plot more than one object on the Graph at one time. 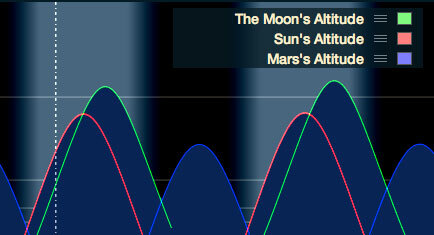 This video graphs the altitude of the Sun, the Moon and Mars. Link A simple demonstration video showcasing the Starry Night Pro 7 Time Travel function. In this video, we travel through 200,000 years, from 99999 BC to 99999 AD, at 100 year intervals. Intervals can be set for seconds, minutes, hours, days, weeks, months, years, etc. 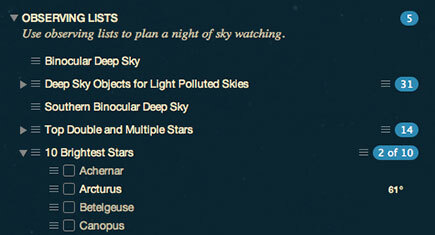 See how the sky will look tonight or tomorrow, or even far into the past or future. Perhaps that’s what the locals were trying to do at Stonehenge. You can also journey thousands of years into the future and sneak a peak at solar eclipses, lunar eclipses, and other celestial events long before they happen. Starry Night not only places you somewhere in time, it also lets you control the flow of events. You can speed up the rotation of the Earth, change the pace of planetary motion through the constellations, or rewind history and watch a solar eclipse as often as you’d like, perhaps changing your viewpoint a little each time. With Starry Night, you are not stuck in the here and now. Of course, you can also journey thousands of years into the future and sneak a peak at solar eclipses, lunar eclipses, and other celestial events long before they happen. Checkout the simple demonstration video showcasing the Starry Night Pro 7 Time Travel function. In this video, we travel through 200,000 years, from 99999 BC to 99999 AD, at 100 year intervals. Intervals can be set for seconds, minutes, hours, days, weeks, months, years, etc. 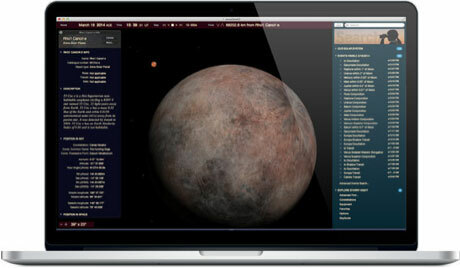 The Observation List is a tool that you can use to help create a list of astronomical objects that you wish to observe. You can make a list of targets for a particular night or create a list of targets that you want to observe over a period of time. For example, you can create a list of open clusters that are visible tonight in your 8-inch telescope from your backyard between 9 p.m. and 11 p.m. Or you may want to observe all galaxies brighter than 9th magnitude over the course of a year. On any given night, Starry Night will let you know what galaxies are visible. Starry Night will even let you know what galaxies you have already observed and which ones you still need to hunt down. We know that both the universe and our understanding of it will change in the future. New moons will be discovered. Bright new comets will streak around the Sun (and many won’t survive). 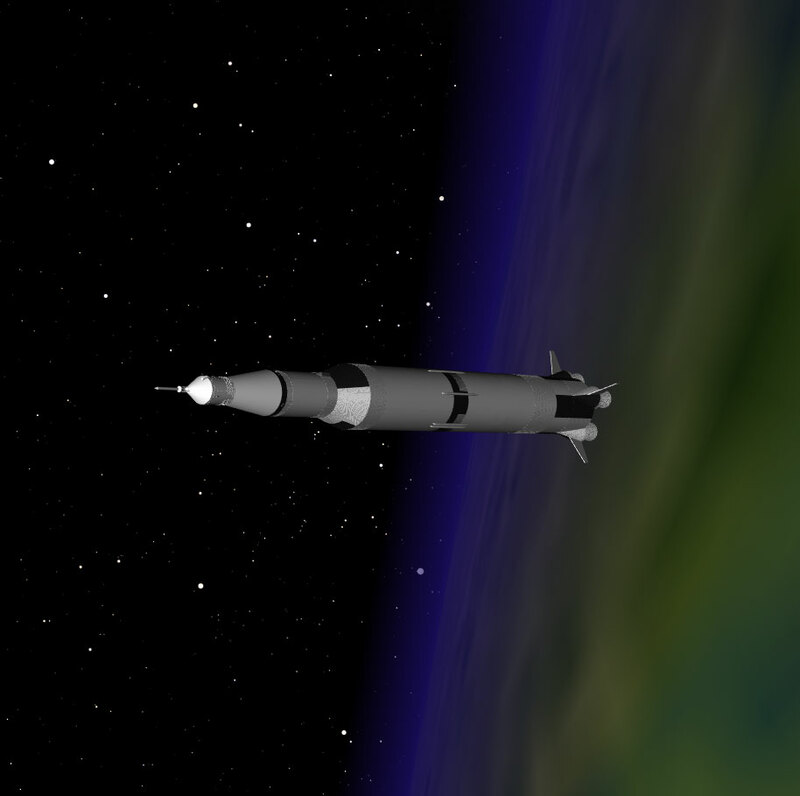 New satellites will be launched into orbit. New planets will be found around other stars. 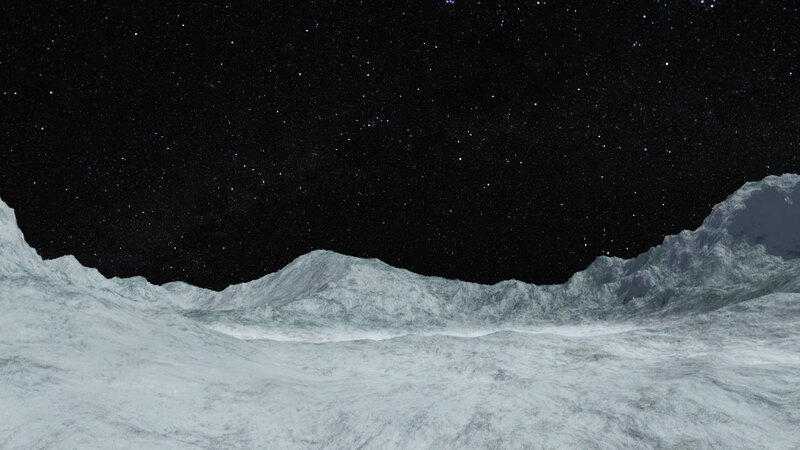 Life may even be discovered somewhere beyond Earth. And to ensure that you always have the most current view, we’ve designed Starry Night so that it can automatically update its vast library of information over the Internet. But since the databases of comets, asteroids, and satellites can change more frequently than other databases, Starry Night also lets you manually download the latest versions. You’ll always know where and when to look with Starry Night’s built-in ephemeris generator. It’s a handy observational aid that creates a table of positional data for any object over the time span and at the interval you specify. You can then export the generated values to a text file and print it out. 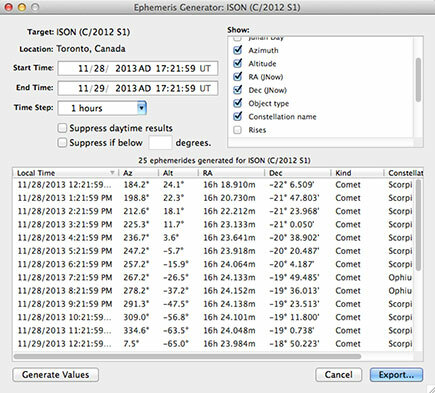 Ephemeris values are handy for knowing where an object will be in the sky at a particular time. If you are using manual or digital setting circles, for instance, you can dial in the generated positional data to locate an object quickly. For example, if you are tracking the path of a fast-moving asteroid as it makes its closest approach to Earth, your ephemeris table will let you know exactly where the asteroid will be during the time period you’ll be observing it. 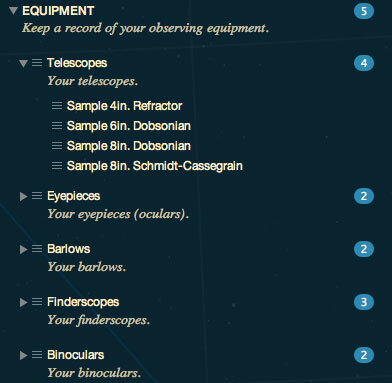 All your observing equipment, such as telescopes, binoculars, eyepieces, barlows, focal reducers, CCDs, and other accessories—all your stuff can be stored in Starry Night’s equipment list. Starry Night can then use this information to calculate your onscreen field-of-view indicator. In other words, Starry Night automatically creates outlines that correspond to the field of view of your various equipment combinations, such as a particular telescope and eyepiece. These outlines help you know how much of the sky you are seeing when looking through your telescope, binoculars, or CCD camera. 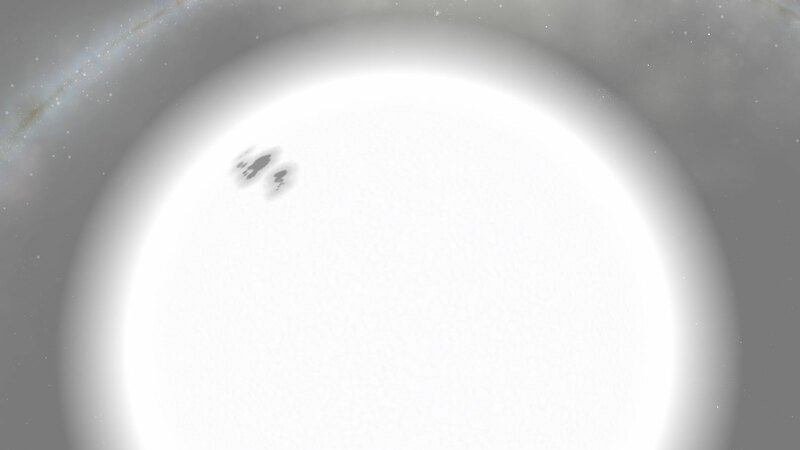 You can also create Telrad, Rigel, and finderscope outlines to help you hop around the sky from star to star. Today, Starry Night can show you millions of stars, but even this is only a tiny fraction of the stars and objects that can be seen through our powerful modern telescopes. 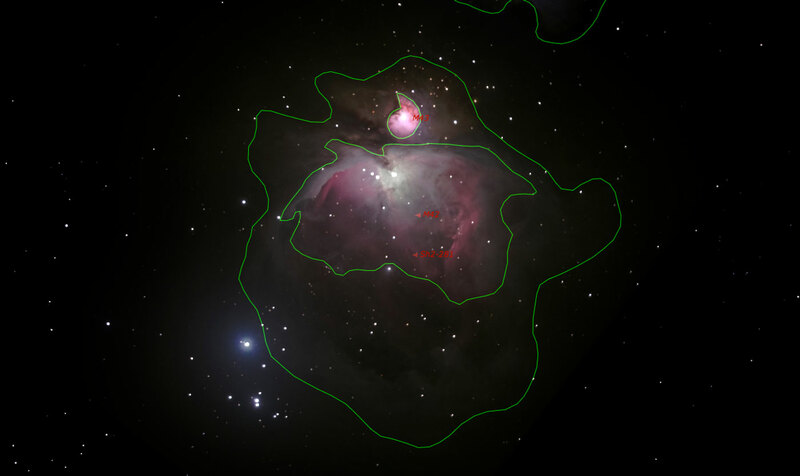 On the Internet, the Space Telescope Science Institute (STScI) hosts a very large database, called the Digitized Sky Survey (DSS). This survey contains large, high-resolution pictures of the entire night sky. The database is so large that it is distributed on a few hundred CD-ROMs, but Starry Night Pro 7 makes it easy to download, import and look at the thousands of galaxies, nebulae, and other astronomical phenomena it contains. Minimum recommended monitor resolution of 1024 x 768 pixels. Not everyone will be an astronaut. But we can all go to the Moon.